Dickinson senior Sarah Archer-Days has been named the 2015 recipient of the Carl A. Rhoades Award. The award is presented annually to a senior student employee who has shown dedication to the college’s dining program. 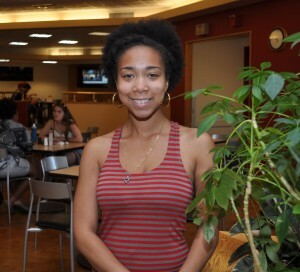 Archer-Days has worked with Dining Services throughout her four years at Dickinson. She has served in leadership positions including as a student supervisor and as retail operations student manager. Archer-Days has been instrumental in creating positive change in the cash operations student employment program and contributed creative ideas. Following graduation, Archer-Days plans to work in marketing within the entertainment field. She said that she is thankful for the unwavering support of Joy Lentz, cash operations manager and has created a new family within Dining Services during her time at Dickinson. The Carl A. Rhoades Award was created by Rhoades, who was the first Dining Services director when the dining operation moved into the Holland Union Building in 1965. Rhoades created a trust to fund the award, using a portion of his retirement funds for the prize. Archer-Days is the 38th recipient of the award. This entry was posted in Student Recognition. Bookmark the permalink.